The man’s suspenders dangle off his back. with a fond, playful lust . . . . This primal love relationship of unquestionable vitality and authenticity is so expansive as to hold within its intimacy their child born of it, “the girl, / who came from something like this, and almost knows it . . . .” A few deft words draw us into the rich drama of the human family, tapping into the sometimes unacknowledged wisdom that resides within. 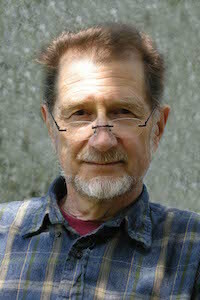 Roger Mitchell is the author of eleven books of poetry, most recently The One Good Bite in the Saw-Grass Plant. His new and selected poems, Lemon Peeled the Moment Before, was published by Ausable Press in 2008. The University of Akron Press published his two previous books, Half/Mask in 2007 and Delicate Bait, which Charles Simic chose for the Akron Prize, in 2003. Mitchell directed the Creative Writing Program at Indiana University and for a time held the Ruth Lilly Chair of Poetry. Other awards include the Midland Poetry Award, the John Ben Snow Award for Clear Pond, a work of non-fiction, two fellowships each from the Indiana Arts Commission and the National Endowment for the Arts, the River Styx International Poetry Award, and the Red Hen Press’s Ruskin Art Club Award. He was a 2005 Fellow in Poetry from the New York Foundation for the Arts. Currently at work on a biography of the poet, Jean Garrigue, he and his wife, the fiction writer, Dorian Gossy, live in Jay, New York. This Closer Look is comprised of two sections. Here, we present a collection of work from Mitchell’s books. On his separate page in this issue, we present new poems. and she and her friends clustered around me, laughing. as soon as I could remember what it was about. and rearranged and written everywhere into the margins. who kept us away from home and the world and ourselves. and it may not have been white, after all. and walking away, going nowhere, for water. she takes a small sip of it and swallows. in its bowl, finds almost wonderful. a dance she almost knows the music to. the small of her father’s back. It’s 1905. What happens next is nothing next to this. downward in a floral exuberance. shredding itself to pieces on the sea's back. up into the land as though from another world. for what we would learn to call each other. a remnant of extinction’s whereabouts. ropey flowages over the darkened bridges. or light putting itself down slowly toward the end of day. things they would never understand, or need to. along the drive on the other. and not knowing what of. or the cloud, it’s hard to say. of the local language its own. office complex. There it was on the shelf. stock reduction sale. No one had read it. It looked interesting thirty years ago. It was practically new, the back uncracked. at the man smiling between the cold pages. was ok. Maybe it was the only way. in the first place to be the world. And the man? of what’s coming, even looking right at it. As we do, who still haven’t read the book. this room, for the first time, as it is. but someone wrote poetry after The Great Plague. Others wrote in the midst of it, dying. It was written in the trenches in France. Scott wrote it at the South Pole. held tight to a burning image. leaping eighty floors hand in hand. of perception, nor did Rwanda. The ovens at Birkenau were rank with it. and rumpled clothes, its useless gestures. Which it knows to be useless. it tells us what we already know. toward the future, wherever that is.